This sky map shows the location of Venus and Jupiter near each other on Sept. 12, 2012, in the predawn sky at 5 a.m. local time as viewed from mid-northern latitudes. The predawn morning sky on Wednesday (Sept. 12) will contain a beautiful celestial sight that will likely attract a lot of attention for many early risers. If you venture outside several hours before sunrise, low above the east-northeast horizon you'll see a slender sliver of a waning crescent moon, weather permitting. And located to its left will be a dazzling, silvery-white "star" shining with a steady glow. That will be the planet Venus, shining at an eye-popping magnitude of - 4.2 (13 times brighter than Sirius, the brightest star in the night sky) from a distance of 85.6 million miles (137.7 million kilometers) from Earth. 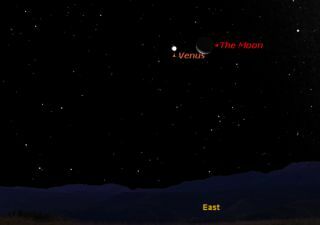 So it is that on Wednesday morning, the moon and Venus, the two brightest objects of the nighttime sky will be separated by about 4 degrees. Your clenched fist held at arm's length measures roughly 10 degrees, so on Wednesday, moon and planet will be about a "half fist" apart. What will make this attractive scene even more attractive will be "Earthshine," where the unilluminated portion of the moon will seem to glow dimly with an eerie blue-gray light. First described by Leonardo da Vinci in his Codex Leicester, circa 1510, this mysterious glow is caused by sunlight reflected off the oceans and cloud tops of Earth, directed toward the moon. The moon will be only 16-percent illuminated by the sun; a narrow, yellow-white sliver contrasting with the blue-gray portion of the rest of the lunar disk giving it a striking three-dimensional appearance, especially in binoculars. And as the morning progresses, the moon and Venus will climb well up into the eastern sky. In spite of the fact that Venus was at greatest elongation (maximum angular separation) from the sun on Aug. 17th, this dazzling planet appears even higher in the sky during this month. In fact, Venus is now at the peak of its highest morning apparition (for skywatchers at midnorthern latitudes) – about 40-degrees ("four fists") high at each September sunrise. And as a bonus, Venus will also slide 2.5 to 3 degrees south of the center of the famous Beehive star cluster in Cancer (M44), from Wednesday through Friday morning (Sept. 14), a very pretty sight in binoculars. Sunrise or late in morning twilight is the best time to study Venus in small telescopes. Telescopically, however, Venus is now just a tiny, featureless and increasingly gibbous disk. By month's end Venus will have descended to within 5 degrees of Regulus, which it will pass exceedingly close to on October 3rd. We'll have more to say about that later this month. Stay tuned! Editor's note: If you have a photo of the moon, Venus and the Beehive cluster, or any other amazing night sky photo that you'd like to share for a possible story or image gallery, please contact managing editor Tariq Malik at tmalik@space.com.